The North Face is looking to “clothes the loop.” The outdoor-apparel company announced Tuesday the launch of a pilot take-back/recycling program designed to reduce the volume of clothing and footwear that enters the landfill. In partnership with the American arm of I:CO—incidentally the same firm that H&M employs to reprocess the clothes from its own waste-reducing initiative—”Clothes the Loop” aims to extend the life cycle of our duds while “engaging consumers to help address the issue of retail products ending up in the waste stream,” according to The North Face. The North Face will accept used apparel and footwear from any brand, in any condition. 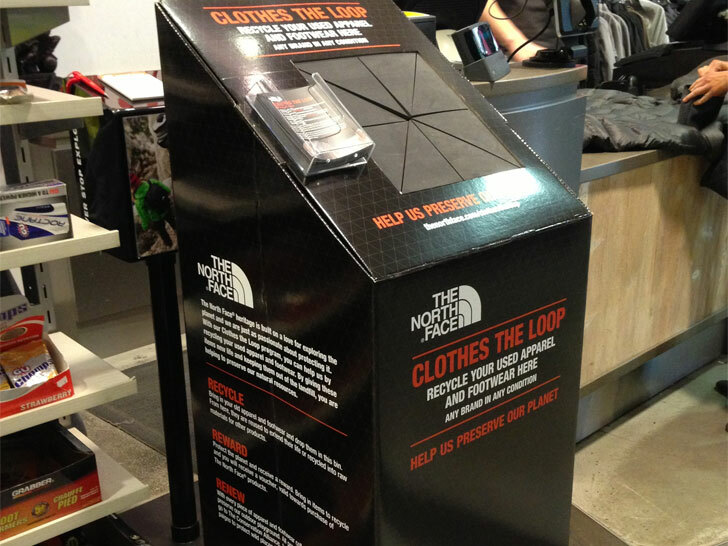 Specially marked “Clothes the Loop” bins can now be found in 10 participating The North Face retail stores in Chicago, New York City, Los Angeles, and San Francisco. The boxes aren’t just for The North Face-branded goods, however. The company will accept used apparel and footwear—anything from T-shirts and beanies to hiking bots and sandals—from any brand, in any condition. Plus, clothing donors will receive one discount voucher per day to be used towards the purchase of The North Face products. Items from the program will be sent to an I:CO recycling center, where they will be sorted into more than 400 categories and designated to be either resold or recycled into secondary raw materials, including insulation, carpet padding, and stuffing for toys. The North Face says it will donate any proceeds from “Clothes the Loop” to The Conservation Alliance, a group of outdoor-industry companies (The North Face included) that uses its annual membership dues to fund community-based campaigns to protect outdoor areas for their habitat and recreation values. The North Face is looking to "clothes the loop." The outdoor-apparel company announced Tuesday the launch of a pilot take-back/recycling program designed to reduce the volume of clothing and footwear that enters the landfill. In partnership with the American arm of I:CO�incidentally the same firm that H&M employs to reprocess the clothes from its own waste-reducing initiative�"Clothes the Loop" aims to extend the life cycle of our duds while "engaging consumers to help address the issue of retail products ending up in the waste stream," according to The North Face.